Published: Faber, 1970. ISBN 0 571 09288 8 [hardback; pp.227]. Currently out of print in English, but a new paperback edition is expected from Gollancz soon. Other past editions have included US hardback and paperback, as well as British paperback reprints: NEL (1971) and Pan (1979). Also in translation. No current UK or US edition. 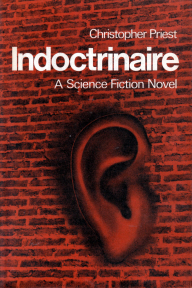 Indoctrinaire was CP’s first novel, a leap into the unknown for both publisher and author. (Faber commissioned the book from an outline.) Although by no means pre-figuring what Priest would achieve with his later books, Indoctrinaire is not without its moments. It describes a future world where the Amazon forests have been cleared, the population has been decimated by a major war, and where the air itself contains deadly, mind-distorting compounds.